This article provides information about the application of binder systems for NOCOLOK Flux. These products can be used in water-based NOCOLOK Flux slurries to improve flux particle adhesion. This is of particular interest for fluxing of pre-formed components prior to assembly in order to reduce flux fall-off and dust formation. Binders are also helpful to pre-coat certain areas with specific flux loads. All binder mixtures can be applied on external and internal surfaces. During the brazing cycle, these binders will completely evaporate (mostly between 350 and 400°C). When used as described below, there will neither be detrimental interactions between the binder and the flux, nor between the binder and the aluminum surfaces. Trials have shown that even at four-times the standard flux load with a binder mixture there was still no surface discoloration after brazing. The surface areas to be coated with binder mixtures must be free of lubricants, oils, dirt, and dust. Means of application include spraying, dipping, and brushing. All NOCOLOK Flux binder mixtures can be applied by spraying with a suitable spray gun (1.4 mm – 1.6 mm) at approximately 3 – 5 bar pressure. The surface temperature should be at least 10°C. When binders are used for flux application, the recommended flux load for good brazing results is the same as it is for the standard process (i.e. between 3 – 5 g/m2). The thickness of the binder coating is usually between 10 – 30 μm. Drying can be done in air – requiring approximately 15 – 20 minutes at room temperature for the coating surface – and 50 – 60 minutes before the parts can be handled. Oven and forced convection drying is feasible too: at 50 – 80 °C, parts will dry within 5 – 20 minutes. Please refer to the MSDS for detailed information regarding the safe handling of the product. For all binder concepts and preparations, the mixtures should be prepared or opened immediately before consumption. 5 parts (wt%) NOCOLOK Thickener (water-soluble). 35 parts (wt%) NOCOLOK Flux powder are added successively under continuous agitation. NOCOLOK System Binder (water-based) already contains the binder and thickener component as well as water. Consequently, only NOCOLOK Flux powder must be added. 35 parts (wt%) NOCOLOK Flux. NOCOLOK Flux plus Binder Mixture (water-based) is a ready-for-use preparation containing NOCOLOK Binder, NOCOLOK Thickener and NOCOLOK Flux powder. If necessary, the mixtures can be passed through a sieve prior to use. This will remove any potential agglomerates. Prior to use the flux powder in the mixture must be suspended. The thickener will prevent the flux powder from settling too fast, however, when stored for some time or diluted, the mixture must be well shaken before spraying. The binder component is activated by oxygen from air. Once sprayed and dried, the product cannot be recycled or reused. Any remaining flux / binder mixture should be stored in an airtight and sealed container. We recommend consuming the mixtures within one week after mixing. NOCOLOK Binder, -Thickener, and –System Binder are compatible for standard NOCOLOK Flux, -LM Flux, -Cs Flux, and -Sil Flux. They are not suitable for NOCOLOK CB Flux and -Zn Flux due to chemical reactions between these fluxes and the ingredients. The formulations (mixing ratios) provided in Solvay’s technical information sheets and brochures are intended as general recommendations – They provide the best basis for automated spray application and have been tested with good brazing results. The recipes can be adjusted to specific application needs by changing the mixing ratios within certain ranges. Higher binder ratios result in a harder coating layer and stronger flux adhesion. But they require more care for the binder removal step. Very high binder and/ or thickener ratios increase the organic content in the mixture – which may result in carbon residues (discoloration) after brazing. It is possible to reduce and/ or to increase the water content of the mixtures – resulting in higher respectively lower viscosity. Water dilution will cause less wetting action and reduced adhesion. A surfactant (wetting agent) is part of the binder formulation – providing uniform coating, and – compensating (to some extent) for surfaces not cleaned prior to application. Thickener is used for adjusting the viscosity and to keep the flux powder longer in suspension – This provides better performance in spray application. Nevertheless, formulations can be prepared and used without the addition of thickener. Cleaning before binder-based flux application is recommended – but not mandatory. A clean surface can be coated more easily and the flux adhesion will be better. Residual oils and lubricants are reducing binder activity and require higher flux load. Higher surfactant levels can compensate for some contamination – but result in more foaming. With 35% flux, the ratio of flux to binder/ thickener on the surface of the headers is sufficient to combat the effects of the high organic content. Also, 15% binder has reasonable adhesion characteristics. At 10% flux, the ratio of flux to binder/ thickener must be modified; otherwise there may not be sufficient flux to combat the high organic content. This is why we propose to reduce the binder and thickener to 8% and 2%, respectively. In other words, too much binder/ thickener and not enough flux may lead to black deposits on the headers after brazing and/ or difficulties in brazing. Under standard storage conditions, the shelf life is up to 12 months and probably longer. Standard storage conditions means that the product was stored at less than 30°C, as suggested in the MSDS. The binder product can be stored at a temperature higher than 30°C, but the shelf life will shorten due to premature aging. Therefore, we recommend that the binder products be consumed within six months, if the storage temperature is a constant 40°C. This is not based on experimental data, but on general knowledge of water based polymer systems and adhesives. Any product stored at a temperature higher than 40°C should be consumed more quickly. Under no circumstances should the binder products, in their original packaging, be exposed to a temperature of 60°C or above. We suspect that polymerization will occur, agglomerates will form and the performance will drop. Please refer to the flyer “NOCOLOK Flux Application with Binders”. Is not possible to only mix the binder, thickener and flux and just add the water on site. Without the water, the flux/ thickener/ binder mixture forms a rubbery-like substance that is very difficult to work with. The least expensive option is to purchase the binder and thickener separately and do mixing of all ingredients on site. The most convenient option is to have a ready-mix, ready-to-use product supplied. Please see above for additional recommendations for mixing. In a flux delivery system, the distances that the flux slurry has to travel is often very short and there is no time for the flux slurry to settle out in the lines or header pipe of the nozzle array. However, if the flux slurry must be conveyed over long distances, to the waste water treatment site at the other end of the plant for instance, then great care must be taken to prevent the lines, drains, pipes and troughs from becoming clogged with settled out flux. The flux slurry is a suspension and unless continuously agitated, the flux will eventually settle out. If the flux slurry must be conveyed over long distances, it is perhaps better to separate the flux and water with some sort of filter arrangement in the neighborhood of the fluxing station. The solids can be collected near the fluxing station and the particulate free wastewater can then be easily transported. A second option is to transport the used flux slurries batch-wise (in drums) to the treatment facility or where ever desired. This eliminates all concerns about flux settling out in troughs or other parts of the plumbing system. In recent years, the topic of what to do with wastewater from fluxing operations has gained a lot of attention in light of heightened environmental awareness and compliance. Years ago, wastewater from cleaning slurry booths, waste flux slurries etc. were simply diluted and dumped down the drain. Some manufacturers are still following this practice, but it is become less and less common. Today, the heat exchanger manufacturers are faced with what to do with wastewater more and more. Some manufacturers collect the waste slurries and effluent from cleaning out the fluxing stations and allow the flux to settle out. The water phase is then decanted and collected until a sufficient volume is collected. At that point, a waste disposal company is called in to collect and treat the contaminated water. This is an expensive, but in many cases a necessary option. If the collected water is relatively clean and not contaminated with oil, it may be reused to top up flux slurries. The only problem here is that one must be certain that there are no other contaminants in the wastewater other than flux ions. If there are other contaminants (and there almost certainly will be), tests should be performed to ensure that these will not in any way interfere with the brazing process. Lauzon, D.C., Swidersky, H.W., “Methods for Eliminating Wastewater from Flux Slurries in Non-Corrosive Flux Brazing”, VTMS 2001-01-1764, pp 649-654, 2001. With continuous use, a flux slurry will eventually become contaminated. So far, there is no data that correlates the level of accumulated contaminants with poor brazing. Therefore, it is better to be on the safe side rather than wait till the number of rejects rise due to a contaminated or dirty slurry. It is therefore recommended that a slurry should be dumped when there is visual evidence of contamination. If there is an oil slick floating on top of the slurry in the reservoir or when it is discolored, the slurry should be dumped and replaced with fresh slurry. Alternatively, to avoid misjudging the quality of slurry visually, the slurry could be dumped at regular intervals, especially if the manufacturer knows that the cleanliness of the heat exchangers entering the fluxing booth is not ideal. Experience will dictate how often the slurry should be dumped. Note however that some heat exchanger manufacturers almost never dump their flux slurries or if they do it might be only once per year. This is only the case when the heat exchangers are very well degreased prior to entering the fluxing booth and efforts are made to avoid undue contamination of the slurry. Simply keeping the cover closed on the slurry tank reservoir will keep out airborne contaminants and lengthen the slurry life. What to do with the used flux slurry is treated covered under wastewater. Flux Recovery – Recycle and reuse? Around the flux slurry preparation station or around the perimeter of the fluxing booth, there will inevitably be some flux on the floor. The inclination is to sweep up this flux and throw it into the flux slurry reservoir or back into the flux drum. This action should be avoided at all costs. Any flux that falls on the floor should be disposed of promptly. The reason is that there are too many contaminants in a manufacturing environment that can affect brazing or cause other damage. Cigarette butts, paper clips, dust, dirt, oil, paper and so on can all have very damaging effects to the flux delivery system and on the brazed products. If the flux is on the floor, dispose of it and do not reuse it. Flux powder on the plant floor should be collected by vacuum cleaners equipped with high efficiency particulate air (HEPA) filters, dedicated central vacuum systems or a wet vacuum system. 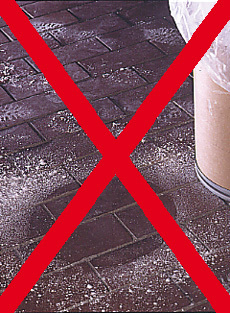 Avoid sweeping and the use of compressed air. Small wet spills may be mopped up. To remove large spills the floor should be hosed down with water. Waste and contaminated water must be disposed of in accordance with local regulations. De-ionized (DI) or reverse osmosis (RO) water is recommended to make up the flux slurries. This is to avoid long-term accumulation of mineral deposits in the flux delivery system that can cause blockage of nozzles and/or inadvertently drop on the heat exchanger. Furthermore, local plant or city water may contain ppm levels of contaminants such as chloride and copper that are detrimental with respect to corrosion performance. Other contaminants may also be present which can affect brazing. Furthermore, to avoid any seasonal variations in water quality, to avoid variations in water quality between manufacturing locations and so on, it is highly recommended that DI or RO water is used to make us flux slurries. In general, it is difficult to comment on potential effects of trace impurities in the flux slurry water without knowing more details about the character of the contamination. There may be only very little influence on the brazing results even with 1,000 μScm-1 conductivity. However, it is necessary to perform a chemical analysis of the water for further evaluation in each case. The use of de-ionized water has always been recommended to prevent scale build up in the flux delivery system. Reverse osmosis (RO) water is also used successfully. There are no recommendations on conductivity or maximum hardness values (except those related to the calcium levels as listed below). The only reference Solvay Fluor can provide is the conductivity of the de-ionized water used at our Technical Services and Analytical Department in Hanover, which is below 0.2 μScm-1. For Chloride a maximum of 0.02% is specified (corrosion problems). Based on experiences at some customer locations with post braze odor in the past, Sulfates should be below 0.02%. Phosphates can cause problems with post braze odor too, due to the potential formation of PH3. Silicates are known to interfere with flux activity. Borates and Silicates can cause black spots on post braze flux residue. Residual hydrocarbons on all aluminum surfaces should be limited to the lowest level possible, due to the potential formation of carbonaceous residue and the long term corrosion problems caused by this residue. The same applies to all other carbon containing trace impurities in the system. Most of the above information refers to flux and flux slurry contamination. However, it also relates to other additives and chemicals in the process, particularly when those additives cannot be,- or are not-, removed from the fluxed component prior to reaching brazing temperature. In the simplest operation, the lid is removed and flux is manually scooped out of the drum (with a large plastic scoop) and added to the flux slurry reservoir tank. The flux should always be added to water and never scooped into an empty tank. Aerosolization should be controlled by a local exhaust ventilation system (LEV). The operator will likely need to wear a dust respirator and PVC gloves, goggles and an adequate protective coverall. For large volumes of flux slurry preparation, it is also common to dump the entire drum contents into the reservoir with a forklift truck. Again, care should be taken to avoid dusting and aerosolization. All slurries must be agitated to hold the flux particulate in suspension. Allowing the flux particles to settle out in the mixing tanks or containers will result in inconsistent flux loadings. During a shutdown period (maintenance, holidays etc. ), the agitators may be turned off. Upon start up, it must be ensured that all settled flux is brought back into suspension prior to starting the fluxing operation. Ideally, the flux slurry should be slowly agitated during shutdown for ease of start-up. Since the flux is insoluble in water and the goal is to keep the flux in suspension, the natural tendency is to use high agitation speeds which creates high shear forces. The high shear forces will break up particles of flux and over time (even a few hours), shift the particle size distribution to smaller particles, even to the sub-micron range. These very small particles tend to be “sticky” and when collected in one place, will acquire a gel like appearance. Furthermore, once the flux has acquired this sticky property, it is very difficult to bring this flux back in suspension after a shut-down period. These effects may be seen even if the speed of the agitator has not changed, but the slurry consumption has decreased (e.g. one less work shift per day). In other words, the same flux is being agitated for a longer time than before and therefore may be shifting to a smaller particle size as a result of the increased residence time in the tote. The key to agitation for flux slurries is low speed – low shear agitation to just keep the flux in suspension. Faster is definitely not better when it comes to keeping the flux slurry suspended. Flux which has acquired a gel like consistency caused by high shear stresses may lead to strainer clogging. Even if the individual particles are small enough to pass through the mesh, once one particle sticks to the screen, others will stick to it and eventually accumulate to such an extent as to clog the strainer. Gelled flux is very difficult to bring back into suspension because it does not break up easily – the flux sticks to itself. This gelled flux will clog a small mesh size strainer in no time at all. The stickiness of sub-micron particle size flux has been associated with many blockages and is often seen to clog nozzles. Large agglomerates are most often formed by the flaking off of flux that has dried on the walls of the spray cabinet or other nearby structures such as exhaust hoods. The best practice to avoid the formation of these agglomerates is to have a regular clean-out procedure. When this practice is not carried out, flux solids will settle out within individual droplets and form clumps or agglomerates. These agglomerates can be very hard and are also often associated with blockages. In its simplest form, a slurry is held in a reservoir tank and continuously agitated to prevent settling. The slurry is pumped, usually with air-diaphragm pumps to the flux slurry cabinet where the heat exchangers moving on a conveyor are sprayed with the slurry. After spraying, the excess flux slurry is blown off in a separate chamber with high volume air. The over spray and blown off slurry is recycled back to the reservoir tanks, again using air-diaphragm pumps. Depending on the sophistication desired, a second flux spray chamber may be installed after the first chamber to deliver a higher concentration slurry to problem areas such as tube to header joints in condensers and radiators. 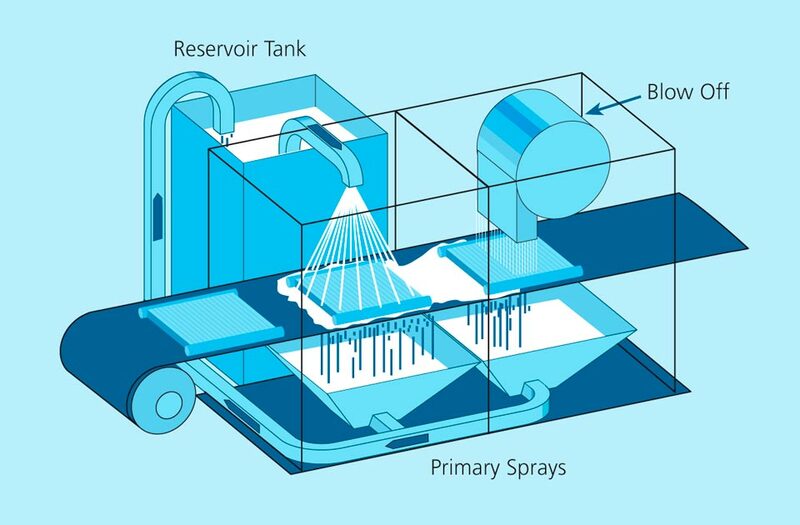 This second spray chamber would have a separate flux delivery system and a separate reservoir tank to contain the higher concentration flux slurry. Note that splashing will occur inside the fluxing cabinet and cause an accumulation of dried flux on the walls. Therefore the cabinet is washed with water periodically to remove this accumulated flux. The frequency of this maintenance operation is up to the manufacturer, but could be anywhere from once per shift to once per month.